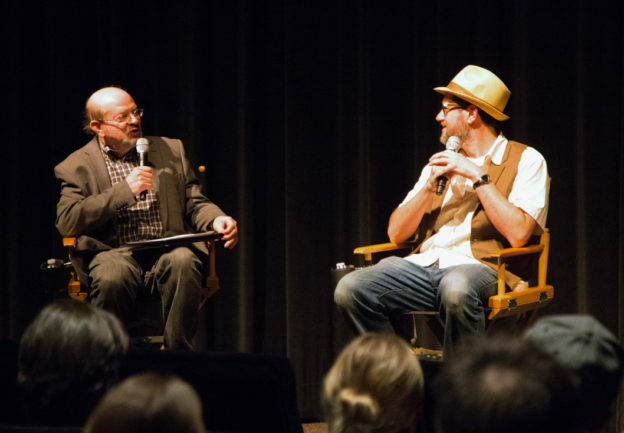 On Monday night, it was my pleasure to lead a Q&A with composer Michael Giacchino after a Society of Composers & Lyricists screening of his latest film, War for the Planet of the Apes, on the 20th Century-Fox lot. It is Giacchino’s second film in the Apes series (after Dawn, in 2014) and his fourth film with director Matt Reeves (the Apes movies, Let Me In and Cloverfield). 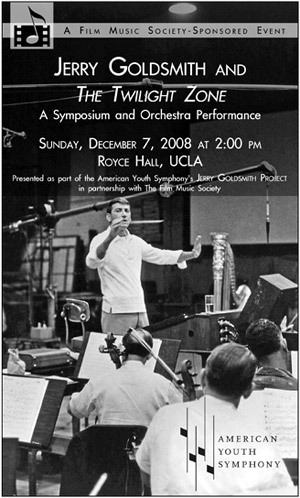 The composer reported that 90% of the score — played by a massive orchestra and choir on the Fox scoring stage — was original, and he even came with props: the mixing bowl used by percussionist Emil Richards on Jerry Goldsmith’s original 1968 Planet of the Apes, and a ram’s horn that he played himself on both of his Apes scores. This entry was posted in and tagged Dawn of the Planet of the Apes, Emil Richards, Fox scoring stage, Jerry Goldsmith, Michael Giacchino, Planet of the Apes, Society of Composers & Lyricists, War for the Planet of the Apes on July 26, 2017 by Jon Burlingame. I was delighted to be asked to moderate a panel, and host a concert, devoted to the music of Jerry Goldsmith. The American Youth Symphony has launched a three-year exploration of Goldsmith’s music, debuting new suites and examining his impact on film music via discussions with friends and colleagues. The afternoon symposium was highlighted by an amazing, live-to-picture re-creation of Goldsmith’s famous Twilight Zone score “The Invaders.” I invited five experts to talk about Jerry and his early years in TV. David Newman conducted new suites from Planet of the Apes, The Sand Pebbles and A Patch of Blue during the evening concert. The Film Music Society sponsored the symposium and published a piece about Jerry and Twilight Zone for attendees. An overview is here. This entry was posted in and tagged A Patch of Blue, American Youth Symphony, David Newman, Film Music Society, film music symposium, Jerry Goldsmith Project, Planet of the Apes, The Invaders, The Sand Pebbles, Twilight Zone on December 11, 2008 by Jon Burlingame.